Apple Intel-based computer such as Mac mini, iMac, MacMacBook and MBP (MacBook Pro) operating temperature of the processor can run to very high degree and hot. The hot CPU is due to the slow fan speed that are set to run up to a certain RPM (revolutions per minute) limit. CPU fan is important part of CPU cooler system, together with heat-sink, thermal paste and etc, so if the fan RPM speed is not fast enough, the cooling system can’t dissipate the heat emitted and generated by Intel processor fast enough, and the CPU may get too hot till affect its performance or worse, stop working altogether. To check and monitor the Intel-based Mac OS X computer operating temperature, Mac users can download and install the freeware app CoreDuoTemp, which is also a menubar application with CoreDuoTemp Widget. Other than CPU operating temperature, CoreDuoTemp also displays indicators of CPU frequencies, CPU usage, and features multiple temperature unit °F, °C or K.
If your Mac system temperature is too high, Mac users can adjust and modify the fan speed to higher speed in order to make the Mac machine runs cooler at lower temperature. There are a few GUI (graphics user interface) based utility software that can help MBP and MacBook (and MacMini) users to control and adjust the speed of the fan cooler. 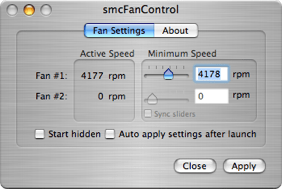 smcFanControl is one of the such fan speed control utility, to cool down MacBook (Pro). smcFanControl let users set the minimum speed for each built-in fan individually. However, in order to protect and note to damage the computer or notebook, you won’t be able to set the minimum speed to a rate which is under Apple’s defaults. So users can increase the minimum RPM speed of the fans to release and dissipate more heat and thus cool down the system. To change the fan-speeds, users need to authenticate with valid credentials of an user-account with admin privileges. Some note is that you need to check the “Auto Apply after Launch” option and add smcFanControl to Login-Items to auto apply your prefer fan speeds settings after restart, and in order not to lose the changed settings after standby, smcFanControl has to run in the background. Another application is GPL-based open source software Fan Control from Lobotomo Software. Fan Control also modifies and adjusts the minimum fan speed. However, Fan Control can controls and adjusts the minimum fan speed by increment of 1 unit constantly depending on the current CPU temperature and user’s preset preferred temperature level automatically. Fan Speed also won’t modify the original automatic fan speed control for safety purpose. While increasing the RPM speed of the fans in MacBook (Pro) can make the laptop and notebook cooler, however, it will consume more power and thus reduce the battery life slightly. And it could shorten the life of the fans too, and the noise of the fan will be louder slightly too. Check out more computer, CPU and GPU temperature, voltage and fan speed monitoring and viewing software utilities.